The melt rate of the Amundsen Sea Embayment in West Antarctica has tripled in the last decade. 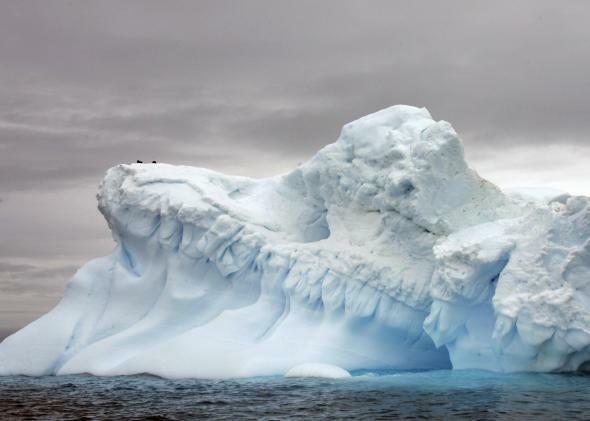 Glaciers are melting in Antarctica, too. When climate change conversations center on glacier melt and sea level rise, many people immediately think about polar bears helplessly swimming the Arctic Ocean. But Antarctica has glaciers, too, and they’re also melting. In fact, the melt rate in West Antarctica’s most vulnerable region, the Amundsen Sea Embayment, has tripled over the last decade, according to new research released on Tuesday. The total glacier loss averaged 91.5 billion tons per year according to the study, which means that every two years for the last two decades it lost a water weight equivalent to Mt. Everest. The loss rate has only been getting worse, accelerating by an average of 6.7 billion tons per year since 1992. The Amundsen Sea Embayment is Antarctica’s biggest contributor to sea level rise. This study, done jointly by scientists from the University of California–Irvine and NASA, is the first to provide an authoritative estimate of how much of the glacier has been lost and how the rate of loss has changed over the last two decades. They used results from four different measurement techniques, with data spanning from 1992 to 2013, to produce the paper, which has been accepted for publication in the journal Geophysical Research Letters. The researchers worked with mass balance measurements, which indicate how much ice the glaciers gained and lost over time.